Google added Morse code to Gboard for Android a while ago and is now offering iOS users the possibility to use it as well starting today. If you don't know how to type in the Morse code, Google has created a game that's available on Android, iOS, and desktop, which will help you learn it in less than an hour. However, for many people with disabilities, typing in Morse code is absolutely mandatory, as developer Tania Finlayson, an expert in Morse code assistive technology and born with cerebral palsy points out. I was one of four kids chosen to participate in a study for non-verbal children at the University of Washington. The study was led by Al Ross, who wrote a grant funding the creation of a Morse code communicator for disabled children. The device was revolutionary. It would convert my Morse code into letters then speak out loud in English and had a small printer installed in it. The Gboard's keyboard layout has been designed with advice from Tania and brought on Android devices first. 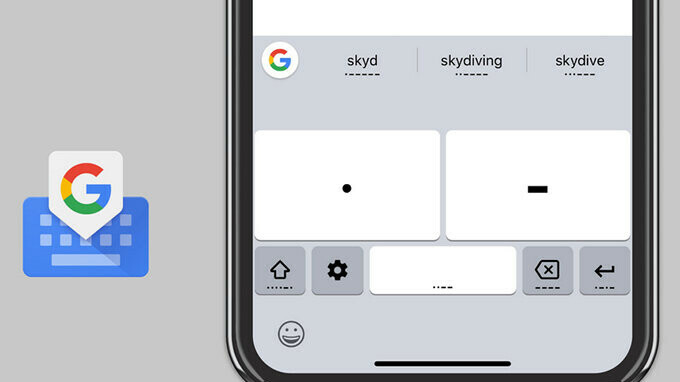 Now iOS users who really need Morse code to better communicate with their loved ones can now take advantage of what Gboard has to offer.